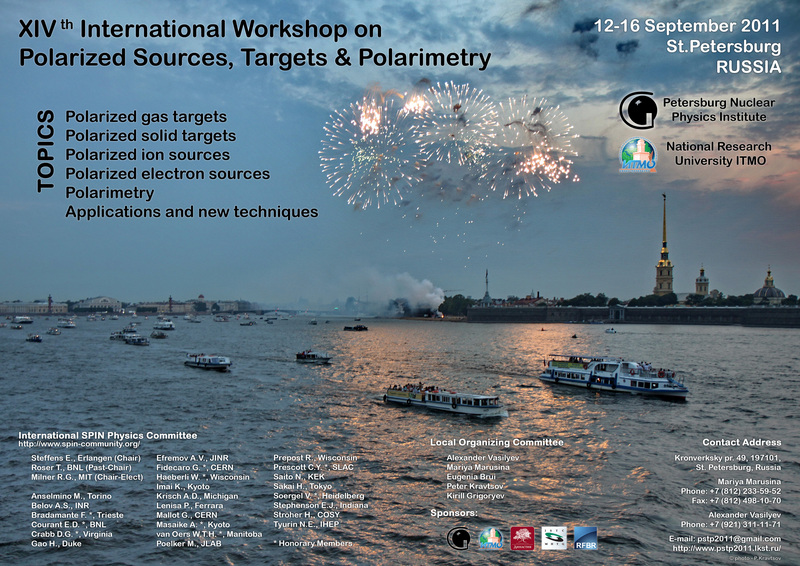 On behalf of the Local Organizing Committee, we are pleased to invite you to the 14th International Workshop on Polarized Sources, Targets & Polarimetry (PSTP'2011), in St. Petersburg, Russia. The workshop will be organized by St. Petersburg Nuclear Physics Institute (PNPI) and National Research University of Information Technologies, Mechanics and Optics (ITMO). The dates for the workshop will be from Monday, September 12 until Friday, September 16, 2011. We will meet you in the St.Petersburg airport Pulkovo 2 on Sunday, September 11, 2011, and welcome reception with registration will take place on Monday morning. - applications and new techniques. Please distribute this announcement to colleagues who may not have received it. We apologize if you are receiving this message more than once. 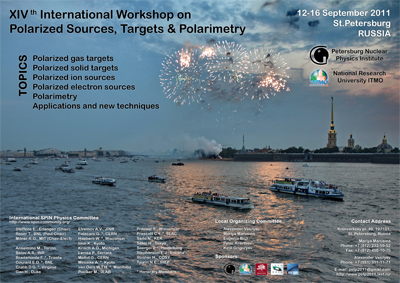 ( http://pstp2011.lkst.ru/poster/PSTP_2011.pdf ) or JPEG ( http://pstp2011.lkst.ru/poster/PSTP_2011.jpg ). You can download PSTP2011 poster as jpeg, tiff or pdf file.